The Apple Watch was announced last fall with the usual Cupertino razzle-dazzle. Which made it easy for the expectant watching world to overlook the fact that although Apple had indeed birthed its long-rumored wrist computer, it had not bestowed upon it a native browser. Indeed, a browser was nowhere to be seen on Apple Watch. In one sense that’s not at all surprising, given the watch doesn’t have a keyboard. But it’s also a pretty big break with convention. Here’s a mobile device whose native view of the web is siloed and segmented. Well, no matter, developers are already beavering away to fill any app gaps left on Apple’s debut wearable. One such long-time iOS developer, Alaric Cole, has built what he reckons is the first browser app for Apple Watch — and managed to get it approved by Apple. It’s called Cufflink. Now obviously a browser on the Apple Watch has pretty big constraints to work with. Namely a tiny screen, no keyboard and a relatively low power processor. So Cufflink is very much browser ‘lite’ — and one that Cole happily admits resembles web browsing as it was back in 1995. But still, a browser. Cufflink uses Siri as the interfacing entity, as you’d expect. So you speak what you want to search, and then the app serves up results with all formatting removed — which means no ads either, just text and media. Cole says it’s using the same Readability tech that Safari’s Reader view uses. Apple is apparently recommending to devs that Watch apps have an interaction time of less than 10 seconds. What can you do on a browser in 10 seconds? Obviously not that much noodling around the Internet but Cole reckons there’s still value in having choice. “The idea came from talking to a friend at Apple about what native apps would be on the Watch. I thought to myself, you’ll be able to use this thing in places you normally couldn’t take a phone — like the shower. It made sense to me to have the ability to look things up, or read an article in full if I wanted. “While a fully fledged web browser seems like too much for such a little device, I thought about how important the concept of hypertext was, and is, to the strength of the web. While the trend is silos of information, I still feel this is a concept that should stick around, even if it’s a bit early for the Watch’s hardware,” he adds. 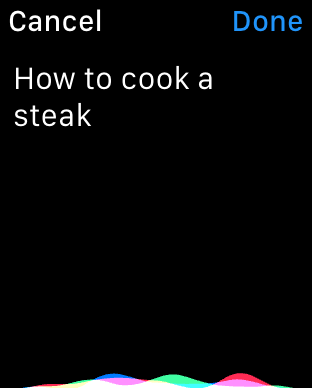 The app also includes a shortcut list of any previous searches (as shown in the video below), so you can access something you looked up before without needing to wrangle with Siri again. “This is the right solution, I think, versus showing some horribly scaled down web view representation. The trick I used, due to the very limited constraints of WatchKit, is to display text and media as a vertical list. Hyperlinks are emulated by allowing you to tap any part of a sentence that contains a link. Doing so pushes another view, and you can swipe back to a previous page, just as you’d expect,” he says. On the challenge side, he says Cufflink took longer to plan than to develop with the main consideration being building an experience that was useful but not overwhelming on a wrist. The wider theme here is that the overpopulated app economy is undergoing a shift — with individual apps being pushed more towards being background services than delightfully distracting interfaces in their own right. Aka the rise of the invisible apps. And the increasingly important role of interactive notifications. Building savvy background services that understand users well enough to serve up exactly what they want the moment they want it is lining up as the next (very) hard problem for devs.